...FOR A THREE DAY OFFICIAL VISIT TO THE UK. 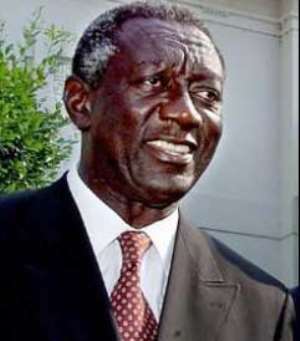 The President , H.E Mr. John Agyekum Kufuor has arrived in London to begin a three- day official visit at the invitation of the British Government. He was welcomed at the Heathrow Airport by Ambassador Arthur Collins, a representative of the Secretary of State for Foreign and Commonwealth Affairs, senior officers of the Foreign and Commonwealth Office, H.E. Mr. Gordon Wetherell, British High Commissioner to Ghana and other senior officials. On the Ghana side were H.E Mr. Isaac Osei, Ghana's High Commissioner to the UK, Mr. Kwabena Baah-Duodu, Deputy High Commissioner, Mr. A.K. Arthur, Minister, Head of Chancery, Mr. Jonathan Magnusen, Minister Counsellor, Welfare and Consular Affairs and Mr. Fritz Andoh, Minister Counsellor Information and other senior officials of the Mission. Tthe President was presented with a bouquet by Ms. Vanessa Magnusen, an eight year old pupil of Donnington Primary School in north London after a ceremonial carpet-lining formed by the Royal Air Force of the Queen's Colour Squadron. Accompanying the President are Nana Addo Dankwa Akufo Addo, Minister of Foreign Affairs; Mr. Gabby Nsiah Nketia, Special Aide to the President; ; Ambassador D.K. Osei, Secretary to the President, Mr. Kwabena Agyepong, Press Secretary to the President and Mr. Kwesi Abeasi, Chief Executive of the Ghana Investment Promotion Centre. Members of the delegation include Hon Yaw Osafo Maafo, Minister of Finance and Economic Planning, Mr. Allan Kyeremanteng, Minister of Trade, Industry and Presidential Special Initiative; Mr Ishmael Yamson, Chairman of Unilever Ghana ; Mr. Charles Mensah, Chief Executive of VALCO ; Mrs Elizabeth Villars, President of the Association of Ghana Industries and Mr. K.Y Asuamah, Director of Europe Bureau, Ministry of Foreign Affairs. While in London, H.E President Kufuor will confer with the British Prime Minister Rt. Hon Tony Blair at the number 10 Downing Street on economic and bilateral issues. He will also hold talks with Baroness Valerie Amos, leader of the House of Lords, Rt. Hon Hilary Benn, Secretary of State for International Development, and other senior officials and some leading British business executives.